If for some reason you do not have any starter tea available to brew your kombucha, you can substitute 1.5 - 3 tbsp of distilled white vinegar (which is .78-1.54% of your overall brew) for starter tea in this recipe. However, only pasteurized vinegars are recommended as substitutes for starter tea. Unpasteurized or raw vinegars may convert your kombucha mother into a mother of vinegar, which is composed of different bacteria and yeasts than kombucha SCOBYs. When it's done brewing/fermenting, does it have a shelf life?how long will it last? Can it be refrigerated? Do I remove the scoby before drinking it? -When it's done brewing/fermenting, you can either bottle the kombucha (directions/links here: http://www.kombuchafuel.com/p/bottling-directions.html), or put the whole fermentation vessel in the fridge. For long term storage, I would recommend bottling. I'd say the kombucha can last up to a year in the fridge in bottles if you have good sanitation. The better sanitation you have, the more likely the kombucha will last longer in the fridge. Putting the kombucha in the fridge puts in in a "dormant" state, where it's fermenting very slowly, at an "imperceptible rate." If you put the whole container in the fridge, be aware that the kombucha will ferment slightly faster in the fridge if the SCOBY is in there, which is perfectly fine if you think you will consume the kombucha within a few weeks. If you do this, you can pour some kombucha out of the container every time you want to drink it (being careful not to contaminate the kombucha/SCOBY), and when the kombucha levels are low again, you can take out the fermentation vessel from the fridge with the SCOBY in it, let the SCOBY warm up to room temperature overnight, and begin a new brewing cycle again. Hope this helped and let me know if you have any other questions! Hi Annabelle. I've been very successfully brewing for about a year and have never had any problems with it. The last batch I made however went a little too long and was incredibly sour and the SCOBY was nearly half an inch thick or more - very big! Healthy and thick and white. So I reserved some of that plain brew for starter tea, as usual, and the batch I started from that appears very flat. There are no bubbles or activity at all in the jar. The culture was very heavy this time and so it has been hanging out way down low instead of at the top. There are babies forming (I brew two jars at a time) on each but I can tell that there aren't any of those tiny bubbles at the surface of the brew and it appears to be lacking something? What would cause the brew to be flat during the brew process even when new culture is forming? It just seems something is very different this time and I can't put my finger on it. Let me know what you think when you get a minute. Thanks! Good to hear from you! Are you using the thick SCOBYs that you have? If you are using the thick one you may want to cut it in half or into pieces- there is such a thing as too much SCOBY that can affect the ferment. The other thing that may be going on is that the bacteria are too strong vs. the yeasts, disrupting the balance, as the yeasts create the CO2. I talk about fizz here http://www.kombuchafuel.com/2010/01/kombucha-fizz.html and the site Kombucha Balance also has some good info on fizz http://users.bestweb.net/~om/kombucha_balance/. Good luck! Hi there, came across your blog while trying to answer a question about my scoby. Great info, thank you! The scoby I have is a very thin mushroom that formed because I didn't finish drinking this particular brew over a year ago. I kept it bottled, completely capped, with the bottle about 75% empty. Just opened it and it had pressure built up. She looks good, just very thin, and it smells like the old kombucha i remember. Is it possible that this scoby could still be alive? Sitting in the dark with no air because it was capped for over a year? I'm planning to try it just for the heck of it, but wondering what you think. Thanks for visiting my blog! You aren't the first to ask this question...and usually I say it doesn't hurts to try as long as it smells/looks ok, and as long as you don't notice anything off-putting, such as strange odors/visual appearance. I have a blog post on this particular subject as well http://www.kombuchafuel.com/2011/05/q-i-left-my-kombucha-mother-in-fridge.html. I'd say go for it! If brewing with it is successful though, I would probably discard it after a few rounds and after you have a nice, younger kombucha mushroom. Excellent info here, thanks! I have been making beer for about a year now, and recently found out I liked kombucha (but I hate traditional American sweet tea). When making Kombucha and bottling do you use an additional amount of sugar at bottling? Do you allow the bottles to sit at room temperature for awhile to carbonate? Thank you, and that's great that you have gotten into brewing kombucha! I don't normally add sugar in the bottling stage, but I don't see why you couldn't, and it would probably add some extra carbonation if that's what you like. Sometimes when I bottle my kombucha I will add additional flavors, such as citrus peels, fruits, etc., and that probably has a similar effect as adding additional sugar when bottling. I usually let the bottles sit at room temperature for a week or so to add some additional carbonation, and adjust that time accordingly, depending on the temperature, how sweet/fizzy I want the brew to come out, etc. I am making my first batch of kombucha. We heat with wood, so our house is usually between 68 and 85. It's been about 11 days, I have protein strings, what looks like a mushroom or two floating on top, and a very thin film floating on top. I do see a bunch of stuff on the bottom, but it looks nothing like the beautiful SCOBY I see online. I bought some homemade kombucha from a health store as my starter. The SCOBY that was in there was just a little mushroom thing as well. Should I just wait longer? Thanks for your comment, I'm sorry that you are having trouble brewing kombucha. It sounds like you are brewing at a good temperature. It also sounds like you might be growing a kombucha mushroom from scratch? If you are, it can take a few weeks or around a month for a good SCOBY to grow. And hopefully you used unflavored kombucha as your starter. I don't know if you are still brewing the batch, but whether or not you had a SCOBY to start with, it can sometimes take more than 11 days for the batch to finish. 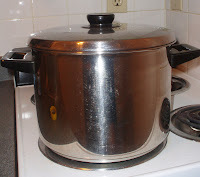 If you go to my blog posts tagged Q&A (http://www.kombuchafuel.com/search/label/Q%26A), you'll find some posts titled When is My Brew Done Fermenting, No SCOBY, and How to Grow a Thick Kombucha Mushroom. 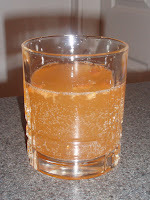 I also have some blog posts tagged with "Grow a SCOBY": http://www.kombuchafuel.com/search/label/Grow%20a%20SCOBY. Hope that helps!